Batman’s been through a few changes in DC’s comics recently. First off, he’s no longer Bruce Wayne, but Jim Gordon. 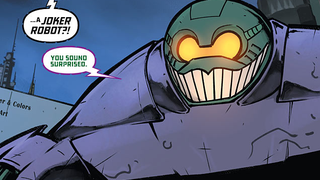 Secondly, he’s now a giant, Jim-Gordon-piloted Mech Suit. That’s all well and good for Batman fighting normal criminals, but now he needs some villains to go robot-toe-to-robot-toe with. Behold, ROBO JOKER. The wonderfully silly development comes from a new preview of Detective Comics #44 from Comic Book Resources, which hits shelves this week. Taking a different approach with Jim Gordon’s Batman than the ongoing Batman series, Detective Comics’ current arc from Brian Buccellato and Fernando Blanco deals with some corrupt individuals in Gotham’s police force, as well as the rise of The Joker’s Daughter following his death at the hands of Bruce Wayne during the “Endgame” comic arc. Her plan? Fight Robots with... more Robots. It’s a sound idea after all. I mean, if Batman gets a robot, why not the Joker? Seriously, this might be my favorite page of a Batman comic book in recent memory. Acknowledge the insanity, get straight to the robot fight. In a Batman book! It’s an interesting bit of duality, having the new Batman face off with the Joker’s own legacy—and as the Joker Bot says, nothing says Gotham City like the Joker and Batman—but honestly, I am 100% sold just for the idea of a Batman/Joker mecha fight. Can we have an entire DC Universe where everyone is just piloting a mechsuit version of their hero and villain personas? I would by all of those comic books. Every single one. Detective Comics #44 is out this Wednesday, September 2nd. Hopefully Joker-Bot survives this encounter for a robotic rematch later down the line.